Most brands of trail running shoes are only offered in medium widths, and this makes fitting a narrow foot extremely difficult. 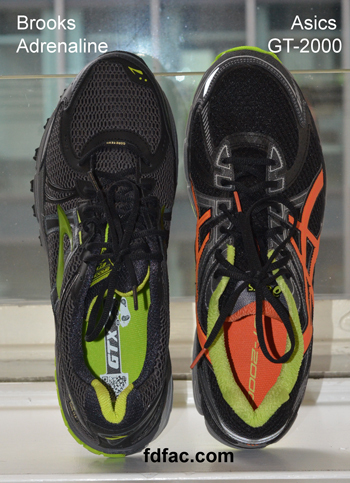 Asics GT-2000 and Brooks Adrenaline ASR are my current favorites in this category, offering medium width trail running shoes which run narrow. Both brands are excellent in terms of design and support. However Asics GT-2000 takes a slight lead in the narrow-shallow department, whereas Brooks takes a slight lead in the support department. An added bonus — both brands offer Gore-Tex, waterproof versions of the above models. This entry was posted in Narrow Feet, Orthotic Friendly Shoes, Shoe Review. Bookmark the permalink. Looking for a recommendation for a walking sneaker – have plantar fasciitis. I only see these available in D width. I’m more like a B width (mens). Are you saying that the D width version of these shows run significantly narrow, such that they might fit my foot? Yes. Even though these are a D width, they are closer to a B width in design and fit. Thanks for clarifying! Just to clarify, I’m mostly narrow in the heel. Thanks! Are the soles stiff on the Brooks? I need a non-flexi walking shoe after being in a boot for 13 weeks with crushed left big toe. 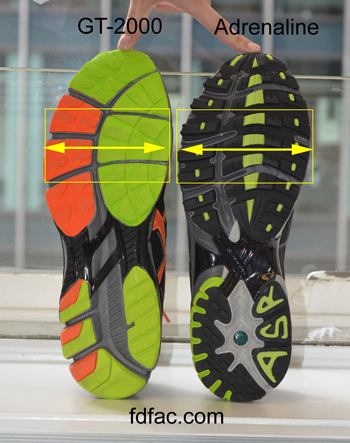 Brooks Adrenaline ASR has an inflexible forefoot sole, which should help with your recovery after the crush injury. 13 weeks in a boot is a long time and returning to activity slowly is important. Fortunately, with your Pilates expertise, you should be back on track in no time. Thanks for visiting my blog!